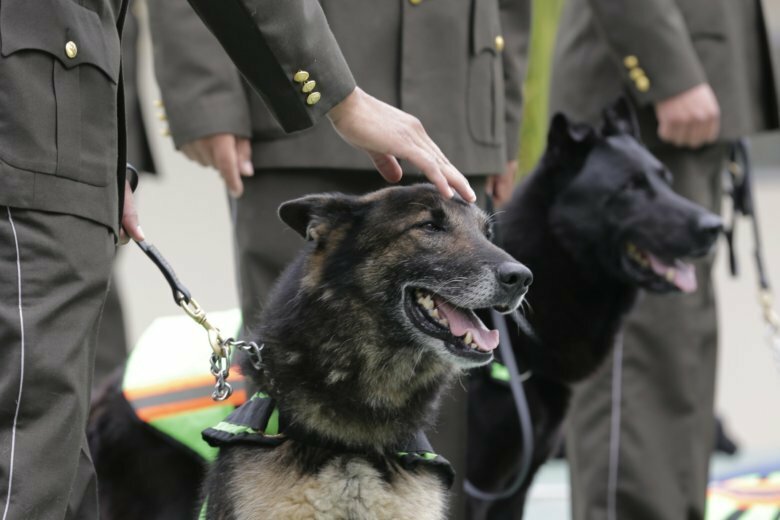 QUITO, Ecuador (AP) — Walking down a red carpet on all fours as an honor band plays Ecuador’s national anthem, 61 police dogs are being officially retired after years spent sniffing out illegal drugs. The majority of the dogs — Labradors, German shepherds and Golden Retrievers on the whole — are being taken in by their former trainers. But the rest were adopted by families who opened their homes to a police inspection as part of a rigorous selection process to ensure the canines have a dignified retirement. Police dogs in Ecuador on average serve for 9 years. Most of their work revolves finding cocaine smuggled through Ecuador. But 16 of dogs retired in Wednesday’s ceremony helped locate victims trapped under rubble following a 2016 earthquake that left more than 600 people dead.